Comments: The Nicholas Section crew maintained the six-mile section of Chesapeake & Ohio track just east of Scottsville. 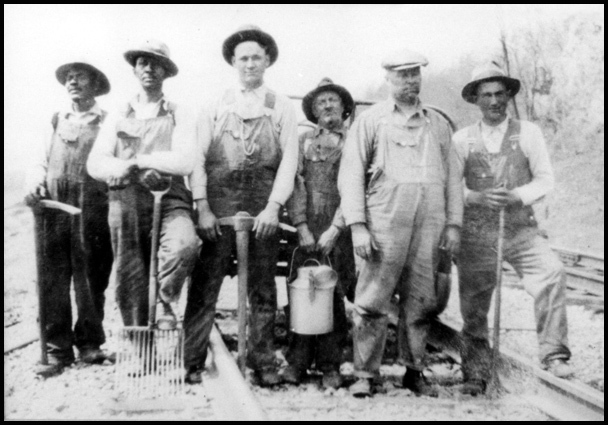 This six-man crew worked 40-hour weeks and were lead for many years by Charlie Schumaker, the section foreman. During the Depression, each crew member earned $3.26 a day, a substantive wage for those times. The crew members in this photo are (L to R): C.C. Hill; J.W. Wood; C.E. Ballowe; Alfred Davis; C.W. Schumaker, section foreman; and E.D. Thompson. Frank Schumaker of Palmyra, the son of Charlie W. Ballowe above, tells the following account of a work day the Nicholas Section crew experienced in 1936: "The Nicholas Section crew daily inspected their six-mile section for defects, repaired it as needed, and cleared the right away along both sides of the track with hand scythes. It was hard physical work with danger a constant companion. Before heading out to inspect the track, Dad first needed clearance from Scottsville's stationmaster, Mr. Taylor. If the tracks were clear, Dad's crew set to work. One day in 1936, on a day which started off like any other day, Mr. Taylor gave the 'all-clear' signal. The section crew loaded their tools and themselves onto their motorcar and set off down the track. I remember that day well as I was standing at a rail crossing near home, watching the motorcar putt-putting down the track. Suddenly I heard the unmistakable throb of a steam engine barreling down the track right at Dad's motorcar. Almost simultaneously, Dad's crew saw the train and jumped off their motorcar like jack rabbits. A second later, the train, with its emergency brakes squealing, slammed into the motorcar and threw tools clear into the old canal. Fortunately, no one was hurt, but not a single man among the crew ever forgot the crash. A bag of chicken feed on the wrecked motorcar burst open in every direction, and the next spring it grew up as volunteer corn to clearly mark the crash site. Thereafter, Dad's crew felt safer in a lever car. This photo was provided courtesy of Frank Schumaker of Palmyra, Virginia; Frank is the son of Charlie Schumaker, the Nicholas Section foreman for many years.